Learn how to download an excel file with Grails and Spreadsheet Builder library. Grails Training - Developed and delivered by the folks who created and actively maintain the Grails framework!. In this guide, we are going to demonstrate Grails file transfer capabilities by creating an app which downloads an excel file with a list of books. We recommend you to follow the instructions in the next sections and create the app step by step. However, you can go right to the completed example. Then, cd into the complete folder which you will find in the root project of the downloaded/cloned project. we are using geb2 feature which includes Geb 2 and Gradle WebDriver Binaries plugin. Geb 2 requires JDK 1.8 or greater. Spreadsheet builder provides convenient way how to read and create MS Excel OfficeOpenXML Documents (XSLX) focus not only on content side but also on easy styling. Externalize your styles configuration into a class implementing builders.dsl.spreadsheet.builder.api.Stylesheet interface to maximize code reuse. public static final String STYLE_HEADER = "header"
Create a service which generates the excel file. public static final String SHEET_NAME = "Books"
public static final String HEADER_ISBN = "Isbn"
public static final String HEADER_NAME = "Name"
public static final String EXCEL_FILE_SUFIX = ".xlsx"
public static final String EXCEL_FILE_PREFIX = "books"
1 Implement grails.core.support.GrailsConfigurationAware to configure mime types and encoding configuration. 3 Set Content-Disposition to indicate the file should be downloaded. 4 Set the download Content-Type. 5 Write excel file to output stream, flush and close it. 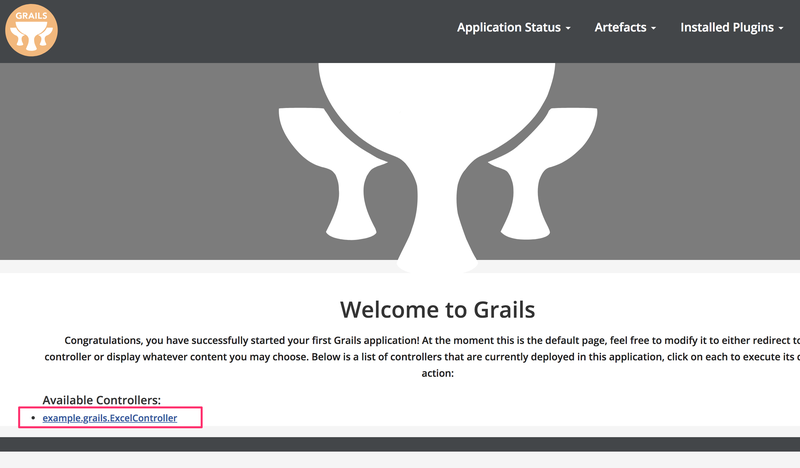 By default, a Grails application created from scratch contains a link to every controller registered in the application. We will test that clicking that links downloads an Excel file. Often, file transfers remain untested in many applications. In this section, you will see how easy is to test that the file downloads but also that the downloaded file contents match our expectations. We use also, Geb; a browser automation solution. We told Grails CLI to use geb2 feature when we created the app in Writing the App section. Grails geb2 feature generates a src/integration-test/resources/GebConfig.groovy file to configure different environments for Geb. Modify it to configure some chrome options to control the download path. geb2 feature installs also webdriver-binaries Gradle plugin; a plugin that downloads and caches WebDriver binaries specific to the OS the build runs on. 1 Pass system property geb.env to the tests. 2 Pass system property download.folder to the tests. Create a test which verifies the Excel file is downloaded and the content matches our expectations. To run the application use the ./gradlew bootRun command which will start the application on port 8080. 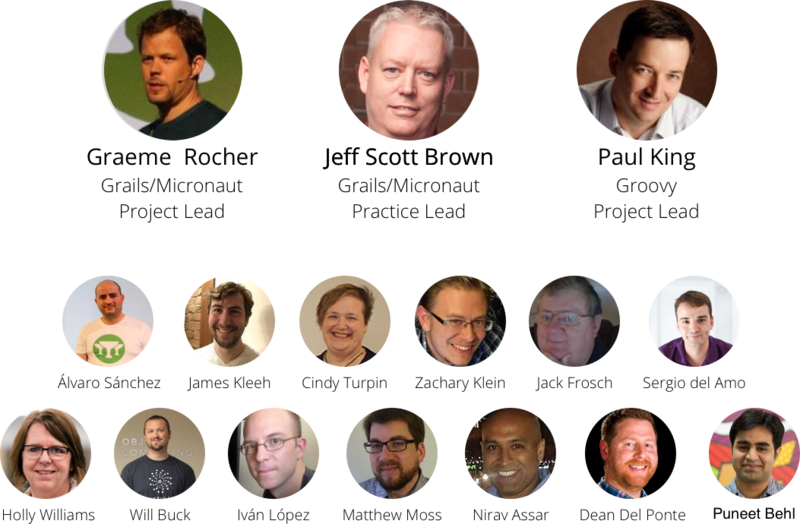 The OCI Grails Team includes Grails co-founders, Jeff Scott Brown and Graeme Rocher. Check our Grails courses and learn from the engineers who developed, matured and maintain Grails.